A god is dead. Who killed him? And why? And what's going to happen to the six million people who live in a city powered exclusively by his magic? "Three Parts Dead" is a very unusual detective story. Tara is a young magician, expelled from her academy in disgrace after she attempted to expose a professor's sick experiments. She's got a lot to prove, and when she's hired to help solve the mystery behind the untimely death of fire god Kos Everburning (patron deity of the city of Alt Coulumb) she knows it's her only shot at building an independent life for herself. When she learns that her old nemesis professor from the academy is involved in the murder of Kos, the stakes get significantly higher. Tara's a fascinating character, and she's surrounded by other complex and intriguing people - good, evil, neither, and both. There are vampires. There are immortal skeleton people. There are gargoyles. There's a hive-mind semi-robotic police force. There's courtroom drama. There are people coping with addiction problems. It's a "secondary world" fantasy - meaning it's set in a world that's not ours. I personally don't love secondary-world fantasy of the "Lord of the Rings" variety (basically medieval Europe + dragons + magic), but "Three Parts Dead" does a good job of rounding out fresh and inventive world-building with enough familiar detail to ground the reader (technology in this world feels roughly analogous to that of a developed nation in the early 20th century here on good old Earth). Also? THIS BOOK HAS A GREAT VILLAIN! For me a work of art often lives or dies based on its villain, and Alexander Denovo is a suitably creepy/compelling/powerful/terrifying figure, whose arc is engaging and resolves magnificently. "Three Parts Dead" is not YA, but it's a great "transition" book for young readers who are beginning to look beyond the YA section. It has all the emotional intensity and fast exciting pacing that we associate with good YA, along with the complexity of plot and protagonists and language that characterize adult fiction. It also has a minimum of cursing and "adult situations," which make it a good choice for readers who don't like that kind of thing. While there are some violent scenes, Gladstone strikes a great balance of leaving the worst of it to our imaginations. On one level, this book is the author's attempt to dramatize the financial crisis of 2008, in which supposedly all-powerful "too big to fail" corporations suddenly collapsed, throwing life into chaos for millions of people. This metaphor is understated and subtly done, and it's totally possible to read and enjoy the book without thinking about any of the big-picture politics and resonance. 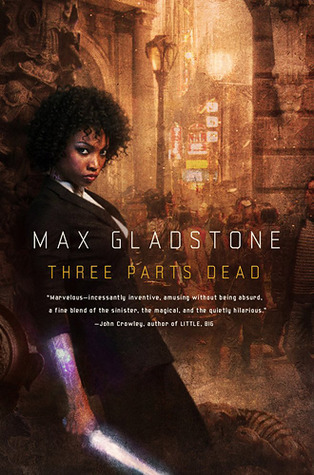 But for boys and young men interested in current events and how science fiction and fantasy can help us understand them, "Three Parts Dead" is an excellent choice.